The American Water Works Association calls it the Replacement Era. 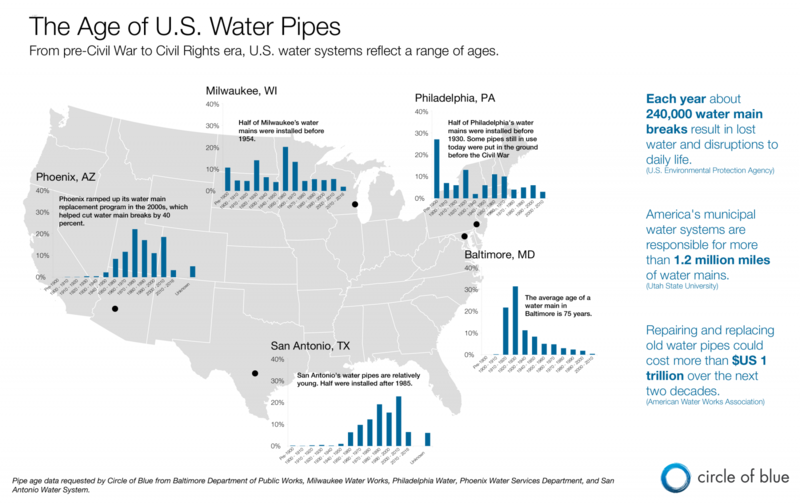 An estimated 1.9 million kilometers (1.2 million miles) of distribution pipes supply Americans with drinking water. Many of them are nearing or have past retirement age. A big investment — perhaps as much as $US 1 trillion over the next two decades — must be made to replace them. Age, however, is only part of the story. The deterioration of any particular pipe depends on a bundle of pressures: What material are the pipes made of? Cast iron, ductile iron, polyvinyl chloride, or, occasionally, wood? Each has a different lifespan. What are the chemical properties of the soil and water? Some are more corrosive. What is the climate? Cycles of freezing and thawing or drought can weaken pipes. The need to replace these pipes, most of which have a useful lifespan of more than 75 or 100 years, will continue to grow. The U.S. Environmental Protection Agency forecasts that the rate of replacement will rise until 2035, as national investment in water mains peaked in the boom years after World War II. The graphic below shows the percent of current water mains installed by decade. The patterns reflect America’s growth. Older pipes weave beneath the colonial cities on the East Coast. Philadelphia, for one, still uses water mains installed before the Civil War. Cities that grew fast in the latter half of last century have newer systems. More than half of San Antonio’s water mains were laid in the ground between 1980 and 2010 — which seems appropriate given that its population grew by 70 percent in that period.